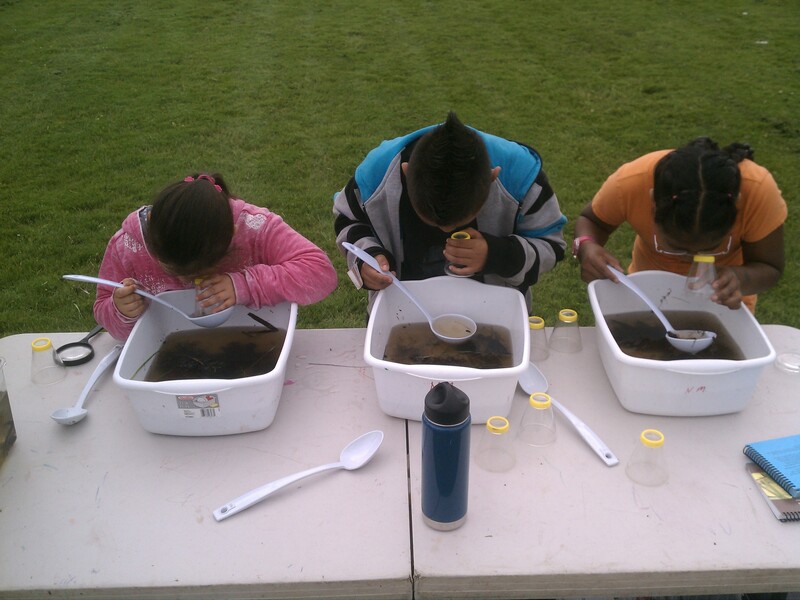 Nature science stations create fun and interactive learning opportunities at your event! Find out if you can match a beaver's skills by understanding water flow to create your own dam. See and touch a beaver pelt and skull to learn what adaptations make them one of nature's most effective ecosystem engineers. Why do people have compost/worm bins? Find out in this interactive program where we bring a working worm bin for participants to investigate each wormy layer up close. Learn about healthy soil, decomposers, and how plants and animals need both to survive. Did you ever wonder how animals stay warm even when temperatures are below freezing? Experience firsthand what it feels like to be a chubby chipmunk storing up for winter or a pint-sized duck on a freezing cold pond. What adaptations do these and other creatures have to help them survive in harsh weather? From the famous banana slug to the illusive wood snail, learn about the unique adaptations these land mollusks have to survive. Then head to the races, where wagers are set as to which slug can cross the finish line first. Not only are owls fascinating predators, but they have an unusual way of devouring their prey- whole! Learn about local owl species and their other adaptations while checking out specimens and dissecting owl pellets. Prices by event length. There is a $2.50 per mile travel fee from the Nature Center. Bring nature into your classroom with one of these traveling environmental education programs led by our experienced instructors. Each program includes a story, real specimens, hands-on learning compontents and ways for students to connect to the natural world in their very own community! are busy! Discover how beavers get all of their chores done. From being born in the water to hovering high up in the sky, the dragonfly lives an interesting life. Learn about the dragonfly life cycle and some of their amazing adaptations. Most people recognize these creatures by their bandit antics and their black masks. Discover how raccoons use their senses and other adaptations to find food and shelter. Find out what makes our local owls different from other birds and where to look for these nocturnal creatures when you are outside at night. adaptations help them survive in the wild. Investigate the interactions between predators and their prey. Birds are unique in many ways. Learn about what makes a bird a bird, what they eat, and how they build nests. Then pick up some tips for your next birding adventure. Ever wanted to inspire a sense of wonder and a better appreciation of nature in children, as a parent, grandparent, aunt/uncle, or babysitter? This program is an opportunity to learn naturalist skills from a seasoned expert and become a nature mentor. We have a variety of additional activities to choose from, so please email or call the Tualatin Hills Nature Center at 503-629-6350 to discuss special requests and find out how we can customize any program for your specific event!